We’re delighted to announce that Village Aid has been selected to participate in the Big Give Christmas Challenge, the UK’s largest match funding campaign, taking place from November 28th to December 5th 2017. Visit our project page on the big give website to donate here. Our Big Give campaign will ensure the community of Akum in Cameroon will have access to clean, safe drinking water. 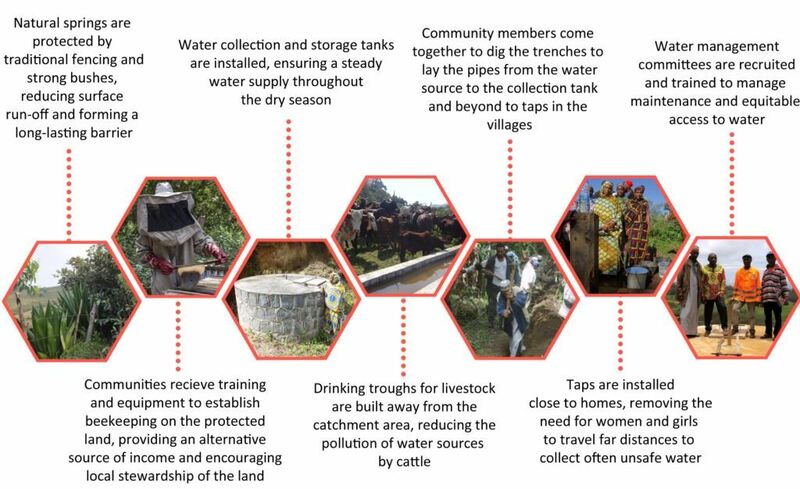 Village Aid will work with our partner in Cameroon, MBOSCUDA, as a part of our ‘In Search of Common Ground’ project, to deliver clean, safe drinking water, through the installation of taps near homes, to 1,700 people living in Akum. The aim of this project is to increase equitable access to essential natural resources whilst reducing incidences of violent conflict across communities in the North West region. Akum is our final target community. Our project has already proven that access to clean water in these communities in this remote part of Cameroon dramatically increases community co-operation, and improves health and wellbeing. Those without access to a tap near to their home spend hours a day collecting water. This job is almost always left to girls. This leads to the girls missing school, but in recent years the chore has become much more dangerous. The proximity of the North West region to the Nigerian border has also left these girls at risk of attack or abduction by representatives of Boko Haram, further increasing the dangers of walking far away from the family home alone to collect water. As a result of our project, the entire community will be able to access clean, safe drinking water. Our projects always respond to the specific needs of each community, and Akum is no different. Akum community is geographically challenging, so to ensure everyone has equal access to water, extensive specialised pipework is needed. This is why we need to raise £20,000 in this appeal. Donations to this project via theBigGive.org.uk will be matched for 7 days from 12pm on 28th November, #GivingTuesday. If you’d like to support Village Aid’s work this year, we highly recommend doing so during the Christmas Challenge as your donation can be doubled during this period, helping your money go much further for Cameroonian farmers. What’s more, as just over £20,000 is needed for this project, an amazing £10,000 of match-funding is available. This means your gift of £60 this Christmas could be doubled to £120, helping to support many more families access clean and safe drinking water. Or subscribe to our e-newsletter here to receive an email after the campaign has launched. You can read more about the Christmas Challenge on the Big Give Website and our Cameroon project on our website here. If you have any questions on how to support Village Aid during this campaign, don’t hesitate to get in touch by email: info@villageaid.org or phone 01629 814 434.